Small upright tree with deeply cut and divided pinnate, dark green leaves giving an attractive overall "lacy" appearance. Small white flowers followed by large bunches of dark red berries. Good red and purple autumn colours. 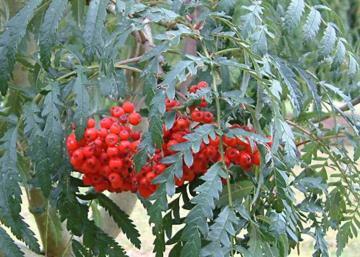 Probably a hybrid of Sorbus aucuparia 'Asplenifolia x Sorbus esserteauana.